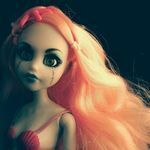 I found (online, so I can't take a look at the actual doll) Scaris Ghoulia in a slimbox that says "Skull Shores" but has a Scaris Ghoulia picture on it. Ghoulia seems to be missing her glasses. Are these fakies, or is it just a mis-printed box? If it were just a mis-print, I'd get her. I wanted to add a pic, but I can't save the pic from the website for the life of me. I'll try later. I feel like these have popped up before.. at an end-of-stock store or something? I could be misremembering. I seem to remember a Scooter Ghoulia showing up in similar packaging too? Someone w/ a better memory (and a less fuzzy mind - dang cold ) will prolly know more. I feel like these have popped up before..